Welcome to "Maywood," a high-quality condo at an affordable price in an excellent location with gorgeous mountain views!! Located just off I-90's 19th Ave exit, in the Cattail Creek area, Maywood is sure to provide easy access to all that the Gallatin Valley has to offer. Enjoy the various walking trails and the pond and park within walking distance. Maywood is only 5 miles from downtown Bozeman, the MSU campus, and the Gallatin Valley Mall. Our goal is to have Maywood feel like your "home away from home"—a comfortable and relaxing space to return to after enjoying some of the many activities Bozeman has to offer. With a 2-car garage, this three-bedroom, two-and-a-half bath condo has wonderful mountain views from all windows, as well as the front porch and back deck. The two flat-screen TVs (one in the master bedroom) come with the DirecTV Choice Ultimate package. Wireless high speed internet is also provided. The master bedroom includes a king-sized bed, walk-in closet, and separate tiled shower and large tub in the bathroom. The second bedroom is equipped with a queen-sized bed, and the third bedroom has two twin-sized beds. These bedrooms are located just off the hall from a full bath. The living room has a sofa sleeper, gas fireplace, and is separate from the TV area. Hardwood floors and granite countertops are throughout the home. 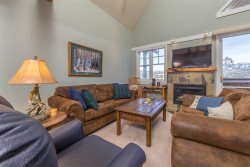 Furnished with new Bozeman "Mattress Mill" mattresses, top quality furniture, and a well-equipped kitchen, this condo is suited to make your stay as enjoyable as possible. If you have children, this home provides a pack and play, high chair, baby tub, and umbrella stroller. Bozeman is certainly a "destination city" and for good reason, and Maywood is perfect place to call home as you explore the Gallatin Valley! The condo was lovely, very clean and beautifully decorated. A great place for rest and rejuvenation. Highly recommended this condo and hope to be back soon. We had a lovely stay in your lovely condo. Thanks! What a wonderful and comfortable home! We couldn't have enjoyed ourselves more. Had great brunches with the gals. Bozeman and the surrounding area is pretty amazing, i'd love to come back to Montana and see more of it if i can - especially in the Summer! Such a pleasure, thank you for letting us stay. A beautiful home and conveniently located! Loved being close to Target :) Thank you! Thank you for sharing your beautiful home with us. All 5 kids had a blast (12, 11, 11, 9 and 9) and the kitchen and laundry helped tremendously. We had meals here, packed lunches and had 9'' of fresh powder New Years day - Fabulous! The stuffed animals were a hit too, thank you! We skied Bridger Bowl on New Years Eve and New years day with our 3 kids and niece and nephew from Deluth. Our favorite moments were hide and seek at night, coming home from skiing to hot chocolate and hot showers and watching the croods. You're house is wonderful! I felt bad being the only one enjoying it for the past four months, but at the same time, it certainly beats living at a hotel. When i come back, i will request to stay here. Thanks! ---Places i'd recommend: Hiked pallisades falls and sacagawea peak, skied bridger and big sky several times and explored Bozeman's downtown scene. Sandwiches from Franks, Sweet Chili for asian food, rosaurs for groceries, check out the meat shop for game stuff, pizza at blackbird and cafe zydeco for cajun. We were impressed by the friendly Bozeman residents. Somewhat overwhelmed by all the subarus. Really happy about the accommodation! I would highly recommend it. Thank you for letting us rent the beautiful home! We couldn't have asked for a better place to stay in Bozeman! Our oldest son graduated from MSU and we enjoyed spending time with family and friends. Your condo is beautiful! It was much nicer than being in a hotel! Thank you for sharing it! Thank you! Your property is awesome! Warm, comfy, a great home-away-from-home! Also enjoyed your books!